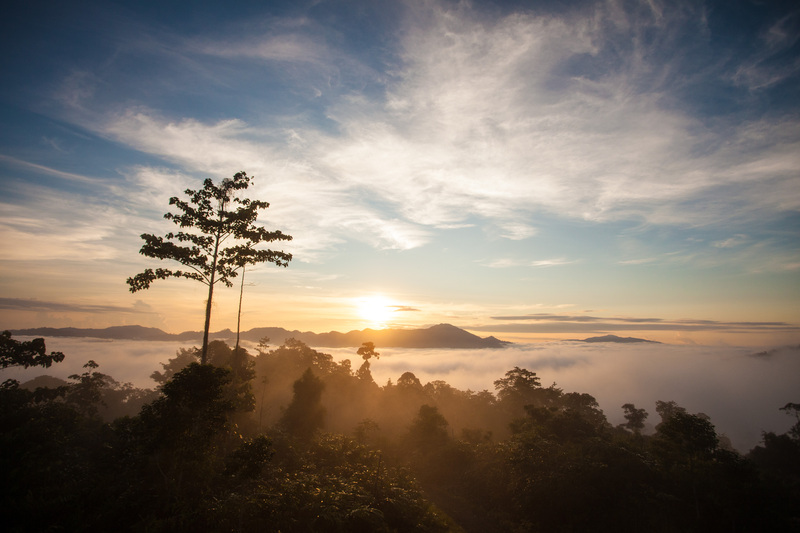 Glorious view of the sun rising over Danum Valley in Sabah. Kota Kinabalu: WWF-Malaysia welcomes the newly minted Sabah Forest Policy 2018 that was launched on Monday by Chief Minister Datuk Seri Mohd Shafie Apdal. The revamp and addition to the Policy sets an overarching framework that will serve to equally benefit the people of Sabah and the environment while ensuring that Sabah’s economic growth is sustainable. The Policy’s vision and mission, which focuses on sustainable forest management will no doubt contribute towards Sabah’s sustainable development and are in line with the Sustainable Development Goals (SDG). The SDGs, also known as the Global Goals, are a set of 17 goals led by the United Nations, covering a broad range of social, environmental and economic development agenda. Launched in 2015, the SDGs came into effect in 2016 and is expected to be achieved by 2030. Through a number of core thrusts, the 2018 Policy is also in line with the Aichi Biodiversity Targets – a set of 20 conservation goals agreed by world leaders to be met by the year 2020 to safeguard global biodiversity. This includes maintaining at least 50 percent of Sabah’s land mass under forest reserves and tree cover, moving towards achieving a No Nett Loss / Net Gain of forest and biodiversity as well as ensuring that 30 percent of Sabah’s land area are totally protected by 2025. The Policy further aims to ensure connectivity of protected areas and to restore degraded forest while promoting the participation of local communities and civil society in forest management. The Policy includes action plans to explore other revenue-generating potentials such as Payment of Ecosystem Services, non-timber forest produce and nature-based tourism. This will reduce Sabah’s dependency on timber stock. WWF-Malaysia is ready to support the government and the Sabah Forestry Department in exploring alternative revenues to keep the forests standing and to create job opportunities. WWF-Malaysia supports the implementation of the Sabah Forest Policy as it will ensure that the strategic development of Sabah and the utmost care of its natural resources go hand in hand to complement each other. “In many ways, trees are the best 'engineering' products you can find – they produce oxygen for people to breathe, absorb carbon dioxide to reduce greenhouse effect, convert moisture in the atmosphere to water, cool the air, regulate microclimate, add nutrient to soil, produce timber, medicine, food, fragrance and more. Diversity of trees bring benefits to different ecosystems including protecting the coast from tsunami, lessening rainwater run-off and flooding, reducing erosion and strengthening hill slopes. They do all these using only solar power in the most efficient manner. Therefore, retention of our forest cover brings many benefits to human, wildlife and the physical environment which we all depend on,” Hui Shim added. WWF-Malaysia also urges the State Government to continue to support the conservation of wildlife in Sabah. Ensuring that more of the State’s lands are protected is a good start. These protected areas need to be further safeguarded through adequate enforcement to minimise illegal hunting, encroachment and other illegal activities. Thus, more boots on the ground are needed. It is only through strong enforcement measures can we ensure that Sabah’s iconic species including the Bornean Elephant and the Bornean Orangutan continue to thrive in the wild. The proper protection of Sabah’s wildlife will also set to benefit the tourism sector as tourist flock to Sabah to see the iconic species. The organisation views the revamp of the Sabah Forest Policy 2018 to be an encouraging move for conservation in Sabah. While further details need to be resolved through regulations and action plans with regular monitoring, the overall Policy has aligned its direction to match global conservation targets in view of the current world environment needs. WWF-Malaysia hopes that the state continues to be at the forefront of conservation matters not only in Malaysia, but also in the world.